NEW YORK (NHL.com) – Ottawa Senators goaltender Andrew Hammond, Montreal Canadiens defenseman P.K. Subban and Pittsburgh Penguins center Evgeni Malkin have been named the NHL's "Three Stars" for the week ending March 1. Hammond went 3-0-0 with a 0.67 goals-against average, .978 save percentage and two shutouts to backstop the Senators (27-23-10, 64 points) to a trio of victories. He denied all 25 shots he faced to record his first career shutout in a 3-0 win over the Anaheim Ducks Feb. 25. Hammond followed that performance with a 35-save shutout in a 1-0 triumph over the Los Angeles Kings Feb. 26, becoming the second goaltender in NHL history to post consecutive road shutouts against the Ducks and Kings (Steve Mason: Dec. 29-31, 2008). He then capped the week with 28 saves in a 4-2 victory over the San Jose Sharks Feb. 28, helping the Senators complete a sweep of their road trip through California and extend their overall winning streak to a season-high five games. The 27-year-old White Rock, B.C., native has started all five games for the club during its current run, becoming the first goaltender in Senators history to win each of his first five career starts. Overall, he is 5-0-0 with a 1.18 goals-against average, .959 save percentage and two shutouts in seven career appearances. 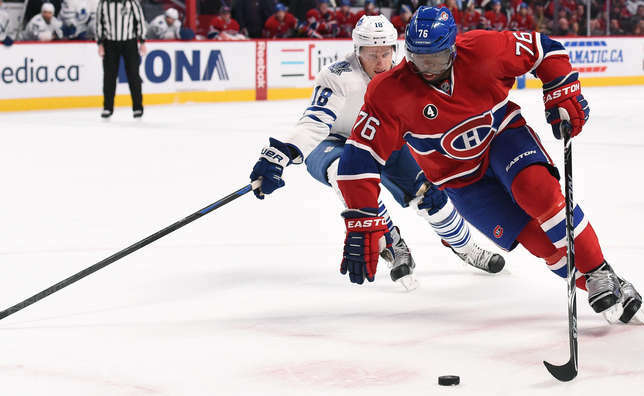 Subban paced the NHL with five assists and shared the League lead with six points to power the Canadiens (41-16-5, 87 points) to three consecutive wins. He collected two assists in a 5-2 victory over the St. Louis Blues Feb. 24. Subban then registered 1-2-3, his fourth three-point game of the season, and a career-high +5 rating in a 5-2 triumph over the Columbus Blue Jackets Feb. 26. He closed the week with one assist in a 4-0 win over the Toronto Maple Leafs Feb. 28, giving him 1-11-12 in his past nine contests. The 25-year-old Toronto native shares second among defensemen with 12-36-48 in 62 outings this season. His 12 goals are two shy of his career high (set in 77 GP in 2010-11), while his 48 points are five shy of his best single-season performance (set in 82 GP in 2013-14). Malkin tied for the League lead with 2-4-6 in two games to propel the Penguins (36 17 9, 81 points) to a pair of victories and their fourth straight win overall. He collected three assists in a 4-3 triumph over the Washington Capitals Feb. 25, his 25th career contest with at least three helpers. Malkin followed that performance with 2-1-3 in a 5-3 victory over the Columbus Blue Jackets March 1. The 28-year-old Magnitogorsk, Russia, native has posted three points in three consecutive team games (also Feb. 22 vs. FLA: 2-1-3), the second time he has achieved that feat in his career (also Feb. 7-10, 2008: 3-7-10). Malkin also is the first player to accomplish that feat for any team since Patrick Marleau did so for the San Jose Sharks Jan. 22-26, 2013 (6-3-9). Overall, Malkin has points in five straight games (5-6-11) and 26-38-64 in 57 outings this season, one point shy of the League lead.